There are two types of Gel Packs - Hot Gel Pack & Cold Gel Pack Use: Children are vulnerable to diseases. There are ailments related to hot and cold temperatures. Immediate attention and timely care helps cure such disorders. The Cold Pack helps reduce pain, swelling, headache, migraine, puffy eyes and many such ailments.The Hot Pack helps improve blood circulation, clogged duct, muscle cramps and bruises. 100% Safe: The products used for children need to be clinically tested for quality and effectiveness. The products should comply to the safety standards. These are clinically tested Packs and safe for children. Leak proof: It becomes messy if a product leaks. It is also not hygienic to reuse such products. 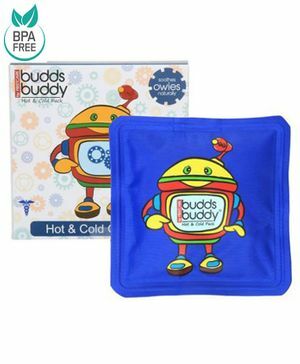 Budds Buddy Gel Pack is made with Double Lock Technology. The pack does not leak even when used for a long time or reused. Reusable: The Gel Packs can be heated by using hot water. These are microwave safe (heated upto 10-15 seconds). For cooling, the Packs can be refrigerated for 30 minutes. Non toxic: Children should be kept away from toxic products. Such products can create serious health issues leading to unrepairable damages in children. Special care is taken to ensure the Packs are non poisonous and non toxic. Easy to Use: the Gel Pack can be conveniently handled by the parents or the caregiver of the children. The sizes are chosen with the children in mind. This ensures the comfort and faster healing of ailments. Kid-friendly design: These are designed based on thorough research by experts from the concerned fields. The packs are comfortable for tender and sensitive skin of children. Simply perfect product with 2 in 1 usefull features ..easy to handle n ready to use always instantly.. safe for kids also n effective completely.